I was recently discussing favorite MMO memories with a friend when the subject turned to the true definition of completely terrible MMO update choices, the infamous Star Wars Galaxies update. Sadly I was a little late joining the Star War Galaxies MMORPG as I didn’t really discover it until its inevitable doom was impending. If you’re not familiar with the update or it was a bit before your MMO time, it’s widely regarded as the biggest mistake ever made in post-release MMO development. 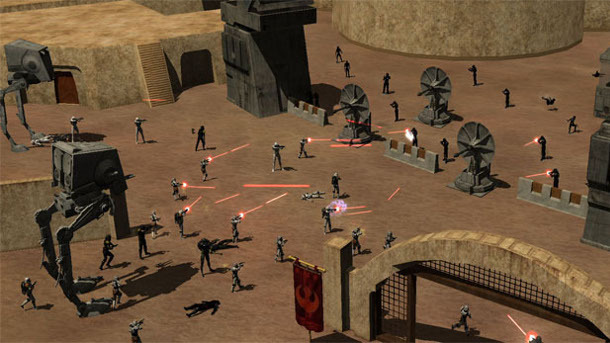 The game originally challenged players to complete a variety of dangerously difficult tasks in order to obtain the rank of the fabled Jedi. This feature built on the progressive reward approach that has made MMO games so popular over the years but it wasn’t that simple. It wasn’t just competing in PvP for a bit of gear or running the same raid over and over for a unique weapon, oh no. The prize involved gaining the abilities and tools of the Jedi. The greatest reward that could be presented in the Star Wars universe was matched only by the incredible journey. So what happened? Well the developers thought it would be a good idea to respond directly to the requests of certain players as they released an update that totally changed the foundations of the game. Players no longer had to work or progress to become a Jedi, it was as simple as selecting the class upon character creation. It doesn’t take a genius to figure out what was to come. Suddenly the entire universe of Star Wars Galaxies was inundated with nothing but Jedi’s. Not only destroying the game so many held so dearly but also completely going against the core of the Jedi lore of the time. put that next to the title and be done with it? If an MMORPG game offered you a really rewarding goal for an extensive journey, would you take that route? I don’t mean the current trend of encouraging endless grind to reach competitive PvP or end-game raids, but I’m talking about a journey that you would have to find and discover for yourself. A unique challenge set to each player that couldn’t be completed by following simple guides or on the shoulders of those that traversed the path before you. Imagine a game that dynamically generated a long series of difficult challenges for each individual player with a highly sought after reward as the end goal. Maybe a unique class or a certain form of travel unavailable to any other player that has yet to complete the task. The challenge would have to be difficult enough so that it would challenge every level of player, not just a simple time+repetition=goal formula. end of the road keep your eyes glued to the goal? I’d love to hear your thoughts so drop a comment below.